Comment: What's Wrong With Car Insurance? This post first appeared in The Spectator Money on 10 November 2016. The insurance industry is the boring uncle of the financial services family – a little drab and likely to be found in a basement listening to Daniel O’Donnell on a Saturday night. By contrast, banking conjures up colourful images of Wolf of Wall Street excess, which has helped to fuel a healthy dose of scrutiny. Being boring has shielded the insurance industry from its fair share of scrutiny for far too long. Issues have emerged that don’t receive the level of scrutiny they deserve. Readers of this article will be all too familiar with freefalling savings rates. It’s a bitter pill, but we’ve swallowed it. 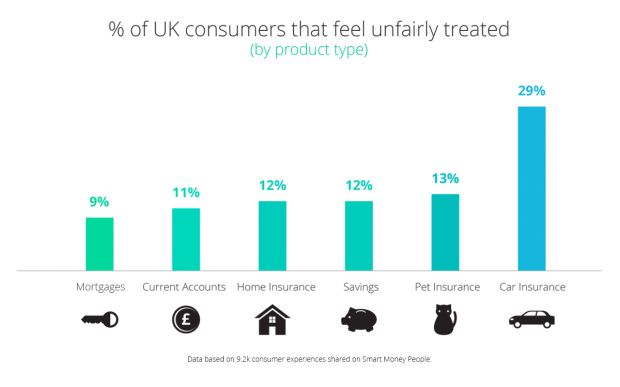 Meanwhile, car insurance is clearly an outlier: 29 per cent of car insurance customers tell us at Smart Money People that they feel unfairly treated, and the reasons for this go well beyond soaring premiums. Let’s start with our obsession with comparison sites. Across opera singers, little robots and cute meerkats, UK consumers are the heaviest users of financial comparison sites in the world, and car insurance is the jewel in the crown. Around 80 per cent of drivers now start their car insurance quote journey on a comparison site, meaning that these sites have become the vital artery for car insurance distribution in Britain. This has helped a raft of lesser-known firms flourish. Firms like Go Girl and Octagon Insurance rely on providing the cheapest quotes on comparison sites to win business. It’s also these types of firms that generate a disproportionate amount of customer issues on sites like Smart Money People. Our data is clear. Household brands like LV= or Aviva are doing a much better job. Just 4 per cent of LV= car insurance customers told us that they felt unfairly treated. A growing proportion of customers are complaining about post-sales complications around issues like no claims documentation which result in forced cancellations. A forced cancellation, even within 14 days of taking out a policy can incur a cancellation fee (£45 is not untypical). Once a learner driver passes their test, insurers review the premium for the remaining period of the policy. Too many insurers appear to be using this opportunity to gauge customers. Customers who refuse to yield to this hike and opt to cancel can be liable for a hefty chunk of the premium, plus a cancellation fee, and even a fee to refund the balance to a credit card. Looking across 43 leading car insurance firms, 25 will attempt to charge you an admin fee for a policy amendment that doesn’t have underwriting implications. The worst offenders will demand a £35 admin fee for simply changing a name. Skeletal staffing and altogether poor customer service that makes customers feel like an inconvenience has sadly become commonplace as firms strive to deliver the cheapest quote. The industry must fix this mess. So being boring has shielded insurance from the kind of scrutiny that delivers better customer outcomes, and it’s high time this changed. The good news is that we need not look too far for a solution. Comparison sites must flex their considerable muscle and remove poor performing firms from their panels. Cutting off this distribution channel will kill off a number of firms, and send a powerful message to others: shape up or be forced to drive off.